Display any photos and videos using Synergy for Final Cut Pro X. This corporate theme production package includes two types of customizable drop zone environments, 4 transitions, 2 lower thirds, 2 sidebars, a title opener, a profile tool, a background and a customizable graph. Synergy provides users with the tools to create professional corporate videos effortlessly. Begin by taking a preset from the Generators browser and placing it into the FCPX timeline. Choose from either of the two environment types. The custom camera environment lets users set start and end orientations so that they can create their own camera movements. The camera presets environment gives users on-screen controls to position scene elements anywhere and a drop-down menu that includes a variety of camera movement options. Synergy contains unique title elements designed for Final Cut Pro X like the title opener, profile tool, 2 lower thirds and 2 sidebars. 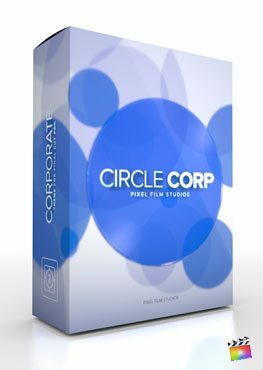 All of these title tools have a variety of professional uses and come together to form the ultimate package for adding stylized text to videos. Gracefully wipe from one shot to the next using one of Synergy’s 4 amazing transitions. Synergy’s 4 transitions include presets with 2,4,6 and 8 shapes. The shapes wipe across the screen and the next scene follows them. Users can adjust colors, angles and more using controls in the inspector window. Synergy included additional generator presets like the Graph and Background Key. The background key is perfect for displaying text and other media while the included bar graph tool is a great tool for displaying statistical information. Both tools comes with a variety of controls for customization. Where do I find SYNERGY Generator Presets? Once the installation is complete, you can find SYNERGY Generator Presets in the FCPX Generators library. Where do I find SYNERGY Title Presets? Once the installation is complete, you can find SYNERGY Presets in the FCPX Generators library. Where do I find SYNERGY Transition Presets? Once the installation is complete, you can find SYNERGY Transition Presets in the FCPX Generators library.